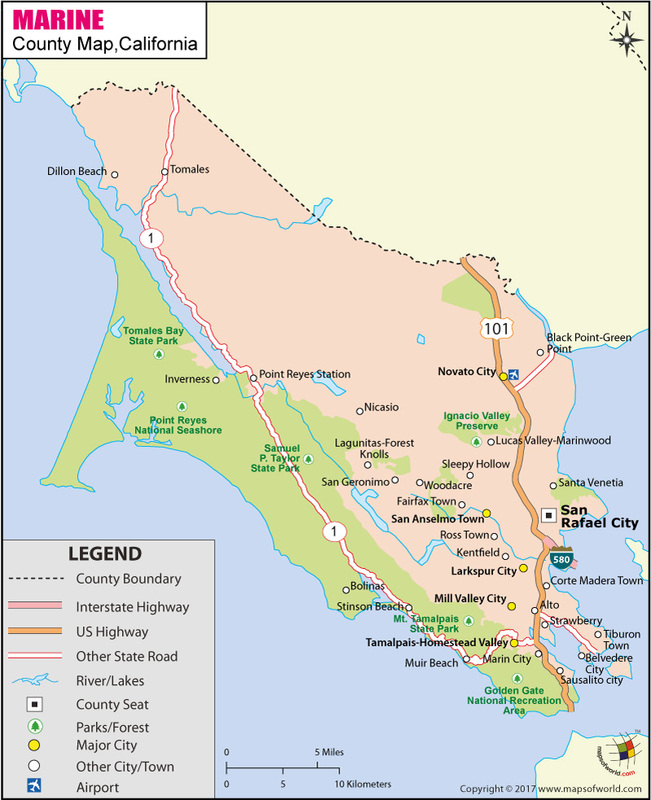 Below is County Map of Marin in California showing the boundaries, roads, highways, towns and much more. Founded as one of the original counties in California, Marine County is located along the Pacific Coast in the San Francisco Bay Area in Northern California. The city of San Rafael is the county seat. Known for its affluence, it is one of the wealthiest counties in the United States. Comprising an area of 828 square miles, it is the fourth smallest county in the Golden State. Eastern side of the county features a string of communities along the San Francisco Bay, from Sausalito to San Rafael. The interior part is mostly under agricultural use and open spaces. Western Marin County, which is accessed via State Route 1, has smaller, outlying, unincorporated communities relying on agriculture and tourism. The sandy stretches of Bolinas, Dillon, Stinson, Inverness, and McClures are popular surfing and summer destinations in California. The Marin County Civic Center, designed by Frank Lloyd Wright, draws scores of visitors to take guided tours of its unique design. Among the natural attractions in the county include the Muir Woods redwood forest, Marin Headlands, Point Reyes National Seashore, and Mount Tamalpais – popular spot for hiking and mountain biking. Interstate 580, US 101, SR 1, and SR 37 are major highways in Marin County. San Francisco International Airport (SFO) and Oakland International Airport (OAK) are the nearest airports served by commercial flights.